A Furrow Cut Short has a foreboding atmosphere created by thick black metal riffing. The layering of instrumentation creates a musical portrait that is vibrant and powerful. It is the sound of a band combining rawness with emotion in a fashion that doesn’t entirely devote itself to either of those two elements. I was impressed by the guitar hooks alone on this album, which is impressive since I usually don’t delve far into black metal that has any raw aspect whatsoever. There is a malevolence to the songs on this album that is combined with a grandiosity in a manner that is interesting and dynamic. This leads to tracks that are brimming with vitality. Drudkh manages to keep the listener’s attention with a poignant and powerful sound throughout the entire track-listing. The sound of the band is close to Winterfylleth to a large degree and Fen to a smaller one. Yet, adding to the similarities list is the overwhelmingly evil aura that recalls the likes of Shining, who appropriately released an album recently. Altogether Drudkh has created a gripping work with A Furrow Cut Short. Instrumentally, A Furrow Cut Short is captivating on many levels, even to a person like me that might not be drawn towards this type of music. Vocally, the singer displays a raspy quality works with the music, but the vocals are certainly one of the downsides of the album for me. It is the overwhelming atmosphere of the band that gives their music density and enraptures the listener. Black metal needs the proper mood to be effective and this album certainly has that in spades. The encompassing aura of the guitar riffs is combined perfectly with the trigger-like drumming in the overall scheme of things. The flow of the album is quite strong although one would wish for slightly more variety. 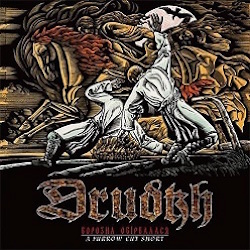 Regardless, A Furrow Cut Short is a very high quality effort from Drudkh.